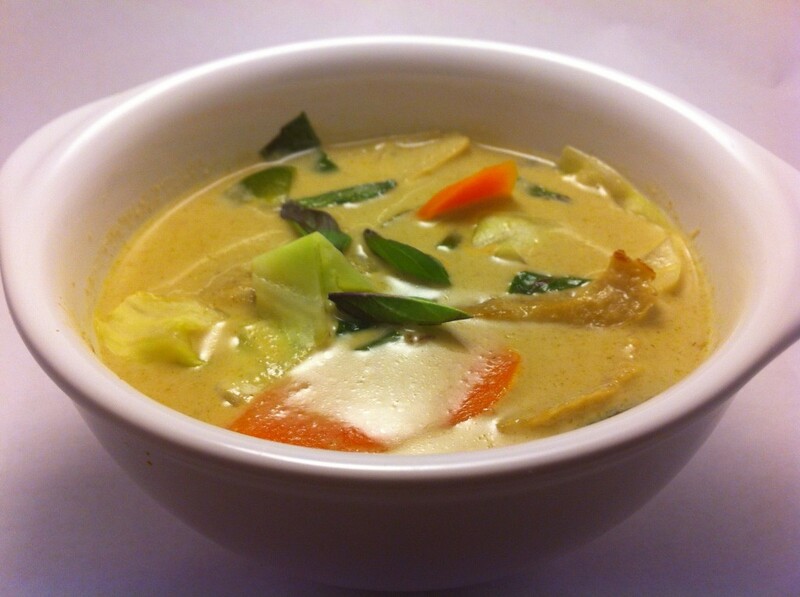 It has been a while since I’ve made a Thai curry, so I decided to make vegetarian Thai green curry the other night. I mostly followed this recipe for Thai green curry on Rasamalaysia, just changing out the chicken for seitan and steamed vegetables. I still can’t get the coconut milk to separate, or split, or have the oil come to the top like I mentioned before! But I did finally find some information on splitting the coconut milk and then frying the curry paste in the oil to get that layer on top. Look here and here. I used “Chaokah” brand coconut milk based on recommendations, but I hadn’t read about cooking the coconut milk first before adding the paste, therefore I did start by frying the paste in oil rather than adding it after the coconut milk separates. And of course it never did separate. But anyways, the flavors were really nice even though it was all creamy and one consistency. I have yet to make my own curry paste because I don’t make Thai curry enough. It would be a lot of work for one meal! This same link I posted above also talks about why it is okay to use commercial curry paste. I can get the ingredients to make authentic curry paste (actually have some galangal, lime leaf and lemongrass in the fridge now) but I think my reason is good too! I will say, however, that as far as the plastic tubs go, the green seems superior to the red pastes. I’ve tried using red and the flavor is funny to me. Oh! But I do like the jar of red curry paste from Whole Foods. I haven’t used it in a traditional red curry, but I have liked it in other stuff. Heat oil in a wok or saute pan (next time I will skip this step and reverse steps 2 and 3). Add curry paste and fry for a minute or so. Add the top half of the can of coconut milk, the cream layer, trying not to dip into the watery part. Cook stirring a lot until the oil separates out (good luck!). Meanwhile steam your veggies and pan fry the seitan strips in a little oil. Once the oil has separated (if you’re lucky :-)), add in the rest of the coconut milk, seitan, bamboo shoots, palm sugar, Maggi, water, salt, and kaffir lime leaves. Cook for 10-15 minutes to get the flavors all to meld. Stir in the basil and steamed vegetables, and serve with brown rice (not sure why, but Thai food is the only thing I like with brown rice), and sambal oelek or other chili sauce.